REN Evercalm products aim to reduce sensitivity, irritation and redness. Evercalm is a clinically proven anti-redness treatment using modern innovations in skin immunology as well as powerful natural anti-oxidents to soothe, repair and protect sensitive and reactive skin. 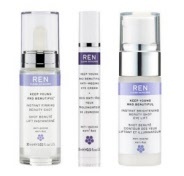 Why choose REN Evercalm over other REN skincare products? What are the benefits of using REN Evercalm? Reduces redness and irritation, Desensitizes, Repairs and smoothes the surface of the skin, Protects the skin from free radicals, Reduces vasodilation, Calms and Soothes. Clincal tests conducted under dermatologist control show a significant reduction of redness in just 21 days. Refresh, Boost and Comfort delicate skin with Neroli Flower, Yeast and German Chamomile.